Pro Level Style and Support. 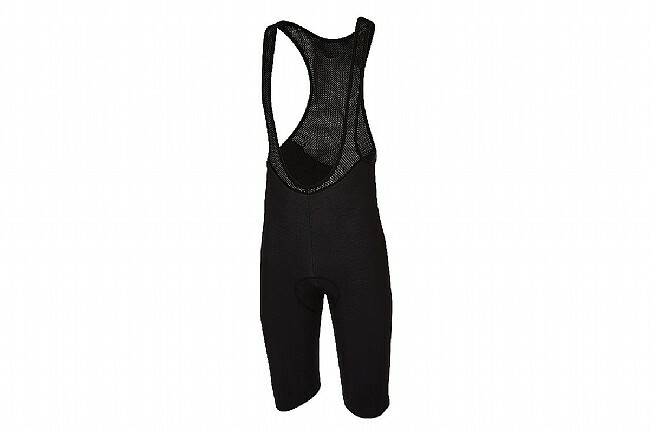 The Men’s Nano Flex Pro Omloop Bib Shorts from Castelli offer pro-level style and support with their extended knee hem. Although it’s only a few centimeters longer, the additional length delivers noticeable benefits in terms of warmth and, of course, style. On the front side, the hem reaches down nearly to the top of the knee cap. Around the backside, the hem curves upwards to prevent bunching. Made primarily from Nano Flex, a flexible, fleece-based fabric with a hydrophilic finish, these bibs are largely waterproof in light rainy conditions, forcing droplets to remain at the surface where they evaporate or bounce off. In steady rain, water eventually seeps through but the insulating properties of Nano Flex maintain warmth so you may get wet but not cold. For sustained comfort in the saddle, these bib tights come with Castelli’s Progetto X2 Air seat pad. The top layer is seamless with an anti-microbial treatment and four-way stretch. It's breathable, as well, to regulate temperature and moisture. The sensitive ischial and perineal zones feature perforated viscous padding to ensure adequate support. Multi-density foam throughout the rest of the chamois ensures comprehensive support.